Hard to define the highlight of astronomical events observed in the past two weeks - but a hi-res video of a mutual event of two Jovian satellites on Aug. 16 from the Philippines may well be it; it's also discussed here, here, here and here while someone else measured a nice lightcurve. A few hours earlier another mutual event movie with resolved satellites was shot in Germany while this this video from France of Aug. 4 led to a fine lightcurve, too. • Io covering its own shadow near opposition. • About the occultation of 45 Cap a long report with some analysis and an article with few insights but pretty pictures. • While at Jupiter, here is a detection of its moon Thebe by an amateur with a scope < 1 m - probably two firsts for this moon discovered by Voyager 1! • About the fading impact spot we have brief updates from Aug. 18 and Aug. 16, a longer report and an update of Aug. 13, a polar animation, a drawing of Aug. 18, pictures of Aug. 7 and Aug. 6 (another one, also an animation and a smooth-morphed version, and yet another picture), several current pictures with & without the spot, a video from July, a long summary of events, a podcast in which H. Hammel discusses the HST observations - and yet another podcast. Saturn's rings at equinox with the Sun exactly from the side have been hard to observe as the planet is very close to the Sun now - but there are pictures of Aug. 10, Aug. 14 and Aug. 15 (a daytime image!) and visual reports of Aug. 14 and Aug. 15. • On Uranus an amateur detection of Miranda (there is still some interest in these moons). • And Venus on Aug. 8. The penumbral eclipse of the Moon on Aug. 6 was invisible to the eye, regardless of optical equipment (incl. none at all) - but the effect could be brought out photographically: by image subtraction like here, here, here, here (more), here, here or here or by blinking like here, here, here (more) or here. • The Moon vs. the Pleiades on Aug. 14, the thin waning lunar crescent on Aug. 19 very close to new moon, very hi-res Moon pics and the ISS crossing the Sun with many details. 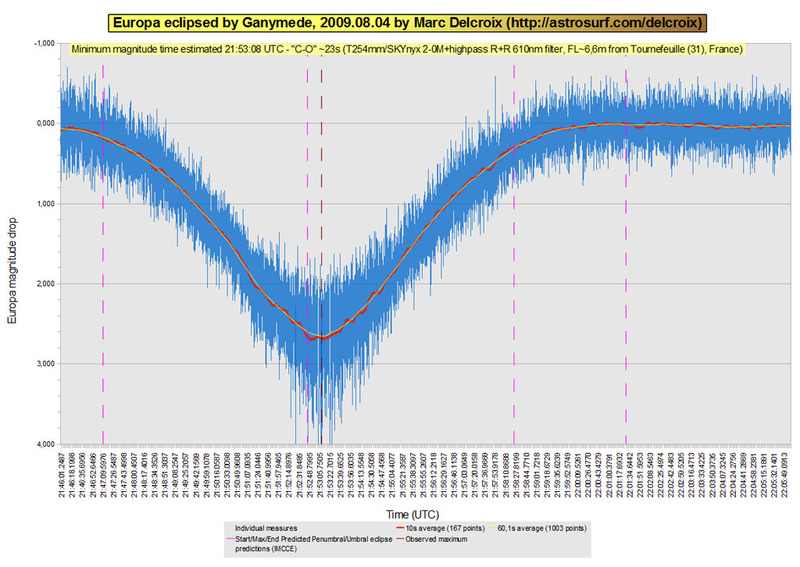 10 years after the big solar eclipse in Europe some look back here, here, here, here or here. • And more pics/vids/reports from the big eclipse of 2009 from Varanasi (contact animation), the Indian flight, Chongqing, Wuhan (plus a picture), Tianhuangping (more, other expedition), Hangzhou, Yangshan, Japan and the Costa Classica (a report and more pics & data). Plus a highly processed corona from Enewetak! The Perseids - more previews here, here and here - reached three separate maxima! From the night Aug. 12/13 a video (someone else had 1000 meteors on his camera), fine Mintron stills, a report from Europe and a composite image, from the outburst on Aug. 12 one locations's data, a report and notes about the brightness of the meteors, from the night Aug. 11/12 a composite, someone thinking these were the best Perseids in years, a review, another one, a gallery, more pictures, another composite, a nice picture, radio experiments, the alleged success of a hyped Twitter event which made not everyone happy (including amateur astronomers because of the extremely low signal/noise) - and a Perseids satire. A fireball over central Europe on Aug. 15 at 20:00 UTC has considerable 'impact' such as here, here, here, here (video during a music festival!) and here. • Meet the SALSA meteor camera. 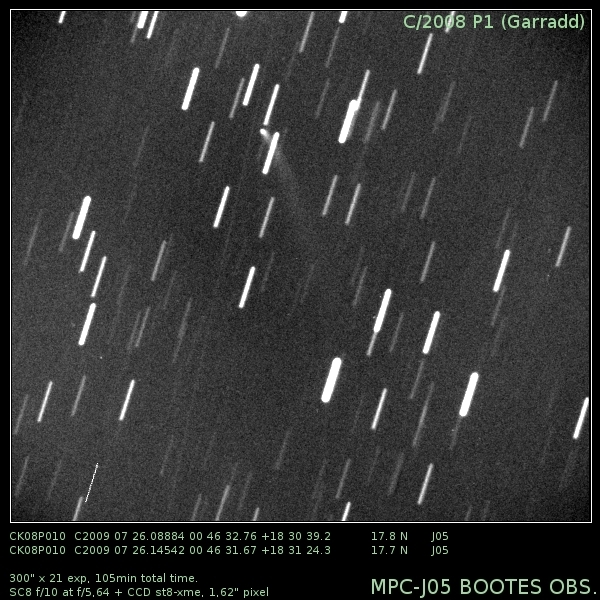 • The new comet Garradd might reach 8th mag. in 2011 while a new Boattini isn't promising. • There are a new Nova Oph (Aug. 17 pig, report) and Nova Sgr #3 (report) - while a bizarre video tried to explain Eps Aur. • Finally impressions from Stellafane 2009. July 6, 0:39 UTC: Maximum of a penumbral eclipse of the Moon; also an animation and an article. It should be seen as a moderate darkening of one part of the disk. Aug. 10: The Sun crosses the ring plane of Saturn, causing exciting shadow effects (which only Cassini can watch well); the Earth then crosses the ring plane on Sep. 4 but this is very close to conjunction. Aug. 11/12: Peak of the Perseids - their activity profile is already ramping up slowly and could reach 200 briefly this year because of several factors. Unfortunately the show will be bathed in moonlight - and accompanied by a Twitter event and various parties. Aug. 14: Jupiter in opposition at -2.9 mag. - and still decorated by the now very elongated impact cloud (for which we also have a Wikipedia entry, transit forecasts, pics of Aug. 5 and Aug. 3 [another one], a movie of July 30 [incl. a morphed version], a comparision of different dates and coverage from Aug. 5 and Aug. 3). Aug. 17: Neptune in opposition at +7.8 mag., still in the vicinity of Jupiter. In other news the expected darkening of Epsilon Aurigae still had not begun by the end of July; notes from a big workshop on the eclipse can be found in this post and the following few ("Newer Post"). • The discovery of 3 new comets may be noteworthy as is this nice image of comet Garradd from July 26. • Wolfram|Alpha is reiterating its claim that it has a lot to offer for all kinds of things astronomical, we have 7 Great Discoveries by Amateur Astronomers and their role in GRB afterglow hunting and discoveries in old spacecraft images. A lot more links about the solar eclipse of July 22nd have turned up (or finally been found by yours truly; see also this meta-list). Science-wise we now have a nice flash spectrum and many weather data (both from Wuhan). From India reports, pics & videos from Surat, Varanasi, Sarasam (crappy video with hilarious soundtrack! ), Taregna (also a TV story) and Patna. From Bangladesh a report, preparations and an event at the Indian border, also hailed here. From Bhutan a video and another one. From Chengdu a report, from Chongqing a report (with a Tibetan prelude), pictures and a processed one, and from Wuhan a report and another one - and CCTV coverage. From Wuzhen more pictures, a report (and related news story), another and another one. From Hangzhou a report in parts 1 and 2, another one and pictures, and from Tianhuangping a report. From Jiaxing a TV story, a report and another one, from Jinshan a report, another and another one, and from Shanghai a video and a news story. From Japan the NHK live TV report, with a hi-res corona/chromosphere/prominences video & horizon pans (and another one from a ship), from the Costa Allegra no eclipse, from the Costa Classica the best eclipse (more pictures and a video from the same observer and still more pictures) and from the Paul Gauguin a report. Eclipses - of three very different kinds - are the top stories right now or should be: in once a mystery object is about to move in front of the star Epsilon Aurigae, in another Jupiter will occult a bright star, and there is a lot more to tell (or rather link) about the longest total eclipse of the Sun of the 21st century. 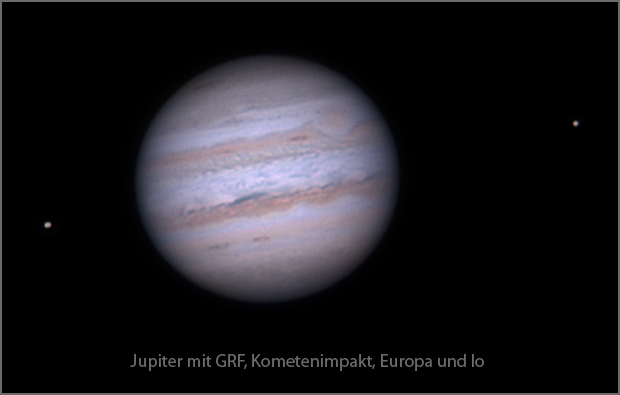 The big story of the past two week, the surprise impact on Jupiter, is being treated in a box in the current Cosmic Mirror, however, while strong noctilucent cloud activity will be covered further down. The eclipse of Epsilon Aurigae - already discussed a year ago and introduced also here and here has actually begun - kind of. A spectroscopic precursor was first seen on 20 July when a new absorption feature appeared, belonging to the mystery occulting object. The brightness of the star in the visible seems to hold at 3.0 mag., though, but could begin its 0.75 mag. decline any day now. • Meanwhile the Moon occulted Antares on 31 July and the Plejades on 18 July. And the mutual events of the Jovian satellites continue, as videos here and here show (plus Jupiter on 5 July with spots and Saturn w/o rings, almost, on 16 July). The eclipse of 45 Capricorni by Jupiter (technically an occultation) takes place in the night of 3/4 August for Europe, and the IOTA-ES has put a lot of information here; more accounts can be found here and here. Many experienced observers are already preparing for the difficult observation (best done with a large scope and a methane filter to suppress Jupiter's glare). Here are a paper and another one on two previous stellar occultations by Jupiter and what could be learned from them - and this paper shows how much science occultation lightcurves can contain, in the case of Pluto. The eclipse of the century has led to many more web pages than mentioned 5 days ago, some new, some only found now. From Space we have images from Chandrayaan of the shadow on Earth as seen from lunar orbit (also discussed here) and the view from Terra and MTSAT. We also have the final prediction - made July 19 - of the corona shape. Observing reports and pictures: From Emei Shan clouds. From Chengdu clouds. From Chongqing pictures, more and more pictures (series). From Wuhan a slide show and corona composite, a report, pictures (more from that trip and some processing attempts, another report, also here) and more pictures 1, 2 and 3. From Anji a report. In other news the night of 14/15 July seems to have been a major one for noctilucent clouds around the globe as reports here, here (by yours truly - from a plane over Russia), here, here, here, here, here and here, the picture pages here, here and here and stories here and here indicate. Almost every night something happens, however: Here are also reports of NLCs in the night 13/14 July (more), 12/13 July (the view from Hersel) and June (more from 18 June). Plus we have occasional volcanic effects. • Currently there is a meteorite hunt in the U.S. locations underway, with the "Mason-Dixon fireball over Maryland - early reports, video, more, more - the newer case, also involving a strange photo through a telescope. Another fresh meteorite discovery in April apparently led to some controversy as reports here, here and here indicate - meteorites can be big business ... • Finally a story on a Japanese SN hunter, advice on a clever sun viewer (if there only was something to view on it! ), a cool ISS in front of the Sun picture, an ISS/Progress sighting and more Galaxy Zoo successes.